If you’re looking for the perfect balance between biking, entertainment, and fun relaxation outdoors, Tempe is a great place to visit. Tempe is home to the Arizona State University (ASU) and full of life with year-round music, food and art festivals, a great bar and restaurant scene, and plenty of activities to do at Tempe Town Lake. With South Mountain and Papago Park nearby, there are a number of mountain bike trails you can ride to. If you have a car you can quickly reach a number of recreation areas with hundreds of miles of multi-use trails. But even without a rental car, it is only a few miles of riding on the road from the hotels in Tempe to get to some of the best mountain biking trails nearby. Papago Park is on the north side of Tempe Town lake, directly across the Mill Avenue Bridge from downtown Tempe. This is the closest option for mountain bike riding in Tempe. 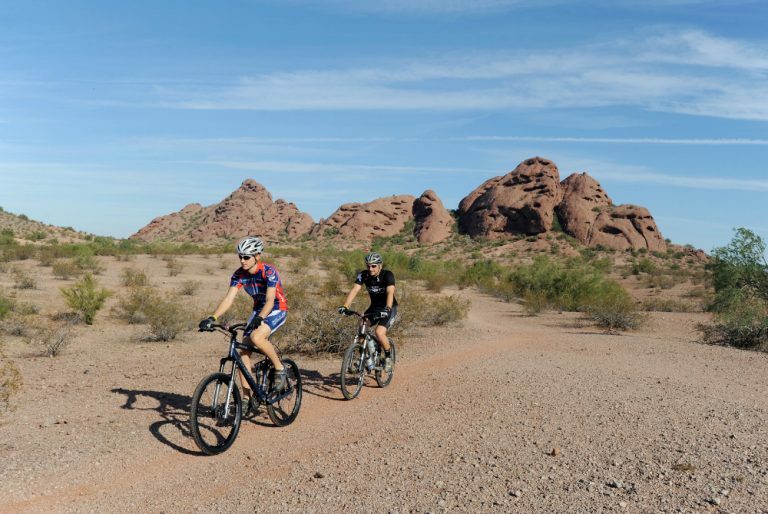 The mountain bike trails in Papago Park are great for honing your skills or just having fun with your friends. Some trail sections challenge riders with rocky chunk and tough climbs, but there are still plenty of options for beginners! New to the area? You’ll be happy to know that Papago Park has an easy network of trails that make it impossible to get lost. String a few of Papago’s loops together and you’ll never ride the same trail twice! During the summer, local riders get together each week for “Short Track Papago”, an informal race in Papago Park. They post their courses here so you can take a look at the competition. “Tempe Cyclocross Tuesday” is another group that gets together every Tuesday during the fall to ride various parks around Tempe, and you can stay updated about their rides here! 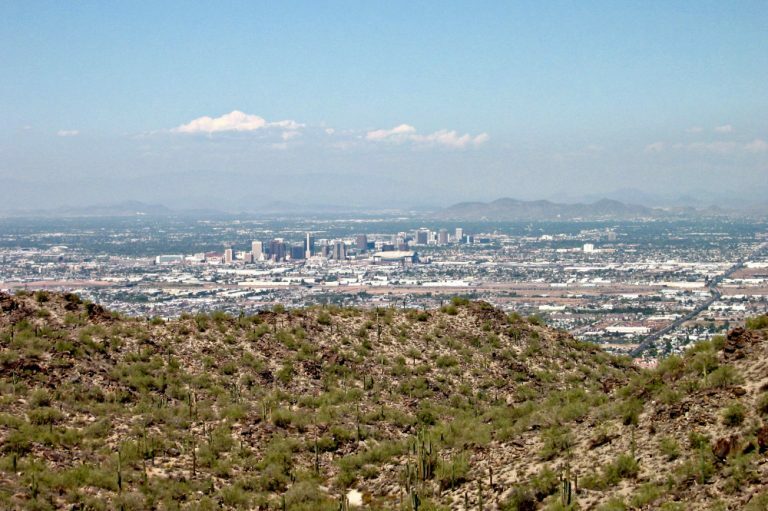 South Mountain is the largest municipal park in the United States at over 16,000 acres and with that, over 50 miles of designated, multi-use trails with something for every ability level. Hop on your bike and ride to South Mountain Park from Tempe, expect to add about 5 miles on the road (each way) to your total distance for the day. 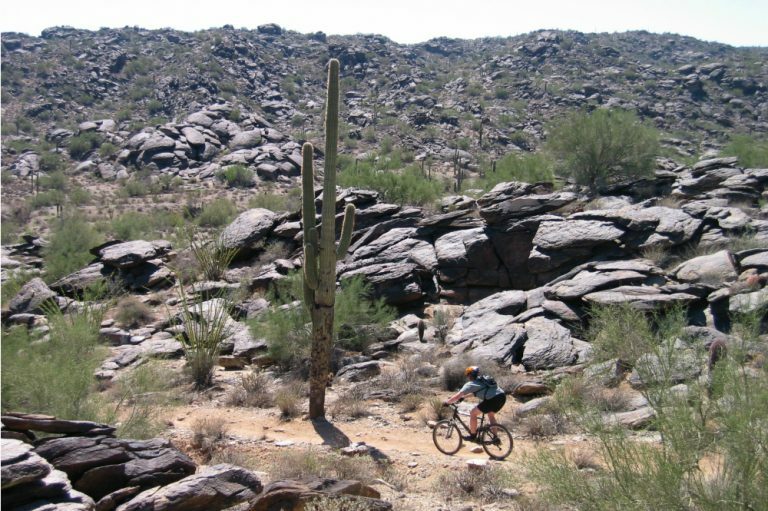 The most popular mountain bike trails at South Mountain are Desert Classic Trail, a popular option that is beginner friendly, and National Trail, a very difficult famous for it’s dry “waterfall” technical feature. If you’re looking for a long, accessible mountain bike ride that will have your legs burning by the end, The Desert Classic Trail is good ride to try. It is one of South Mountain’s more popular rides because of its fun rolling singletrack and beautiful views of the desert. While there is little elevation change over all, this trail will be a challenge to beginners with the technical terrain it covers. Be ready to ride semi-rough and rocky terrain, ups and downs, and wash crossings. Access the Desert Classic Trail from the Pima Canyon trailhead or the Desert Foothills trailhead. Mix it up on South Mountain with a mountain bike ride over three different trails! Start from the Beverly Canyon trailhead and warm up with a climb up the Javelina Canyon trail. The most difficult section of this singletrack trail begins as you hop on the National trail until the Mormon Loop trail. This ride will be full of short, rocky, and steep sections but the view is spectacular from the ridgeline. There is nothing like mountain biking the backbone of a mountain. A ride with various levels of difficulty, it will be a challenging, but even more rewarding on the descent. Between the cycling and mountain biking clubs and teams of ASU; the major biking events held in Tempe such as Tempe Tour de Fat, 6 hours of Papago, and Xterra Off Road Triathlon; and locals who love to live a laid-back-beer-lovin’-yet-active-lifestyle, you’ll find Tempe is a popular mountain biking destination. If you need to rent a mountain bike to take advantage of the mountain bike trails in Tempe, check out AOA’s mountain bike rental options here. Hotel delivery options are available in Tempe, give us a call at 480-945-2881 or inquire to see if we deliver to your hotel.